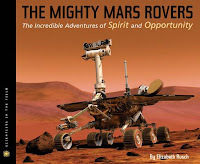 The Mighty Mars Rovers: The Incredible Adventures of Spirit and Opportunity by Elizabeth Rusch. Grades 4-8. Houghton Mifflin, June 2012. 80 pages. Review copy provided by publisher. In 2003, two go-cart-size rovers were sent to Mars. Their names were Spirit and Opportunity and their mission was expected to last six months before the harsh climate and dust of Mars rendered the rovers unable to function. Controlled by scientists on Earth, the rovers sent back photos, tested rocks, and reported other information about Mars. Scientists were hoping to find evidence that Mars could have supported life. The rovers were expected to last six months. The Mars terrain is treacherous, the winters are brutal, blowing dust can easily block the receptors that gather solar power. The rovers were expected to last six months. Spirit lasted nearly seven years and Opportunity is still rambling around on Mars nearly nine years later. These little machines trekked many more miles than scientists dared to hope they could. They explored craters and mountains and eventually found evidence that Mars could have supported life at some time in the past. The Mighty Mars Rovers is an incredible story of science and perseverance, of problem-solving from millions of miles away. You already know that any book in the Scientists in the Field series will provide rich back matter, incredible photos, and an inside look into the life of a scientist. What sets this book apart is Elizabeth Rusch's ability to bring the Mars rovers to life. Of course the scientists that worked on them for so long and had so much invested in their success would feel a connection to them. Rusch is able to bring that across to the reader. Perhaps it's because they look a little like WALL-E*, but Rusch creates characters out of Spirit and Opportunity. She allows readers to get to know them and cheer on their triumphs as their scientists pushed them to achieve more than anyone thought was possible. Hand this one to young star-gazers and budding astrophysicists and engineers. Publication is perfectly timed: the latest Mars rover Curiosity is scheduled to land on Mars in August 2012. Check out NASA's Mars Rover Mission website for updates on Opportunity and more information. The Mighty Mars Rovers hits shelves on June 18! *Okay, technically WALL-E looks a little like the Mars rovers.